Due to their great versatility, fiber-based materials make up an estimated 10 percent of all materials currently on the market. But turning fiber-based materials into technical textiles is subject to high quality standards and strong cost pressures. Help is provided in the form of sensors, digital assistance systems and connected production. The ITA Academy from Aachen, Germany, demonstrates the current state-of-the-art at HANNOVER MESSE. Textiles have long since become more than just T-shirts and jeans. With approximately 1,400 companies and sales of 35 billion euros, the textile and clothing industry is Germany’s second largest consumer goods sector. 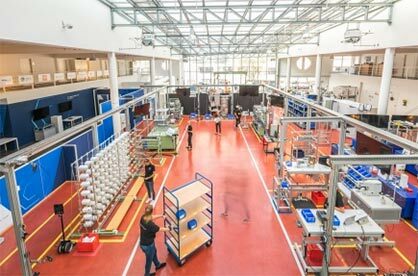 In the field of technical textiles, Germany even leads the global market, according to the Confederation of the German Textile and Fashion Industry. In order for Germany to retain its competitive advantage, companies need to capitalize on digital technologies and their own innovative potential by further training their employees. And this is the task which the ITA Academy GmbH has set itself. Many clients wonder what Industry 4.0 actually means for their enterprises, and how they can generate benefits from data usage. A series of workshops and training sessions at the Digital Capability Center in Aachen will allow specialists and managers to gain valuable knowledge in this area, while at the same time acquiring skills they can use to drive digitization at their companies. The heart of the Center consists of a realistic textile production line in which a smart wristband is manufactured. As in many real production plants, various problems occur along the process chain. First, participants will practice how to independently identify the potential for process optimization in non-digitized production. Only in the next step will they then experience production in a digitized state. Armed with sensors, machines and digital applications will demonstrate how manufacturing processes can be made more efficient. Using the textile value chain as an example, participants will learn how digital solutions work and how they can be modified and optimized using new technologies – from augmented reality for maintenance work to reduce downtimes to smart wearables – small computers worn on the body that enable error-free order picking in logistics applications. In addition to training and workshops in the field of digitization, the ITA Academy also offers further training in the field of textiles, providing participants with new skills for the age of digital transformation. The subjects range from basic textile technology to specific textile innovations in areas like medical technology, automotive production or smart textiles. Visitors to HANNOVER MESSE 2019 will find the Digital Capability Center in Hall 2 (B30) at the German State of North-Rhine Westphalia’s (NRW) pavilion, where developers and scientists from the ITA Academy GmbH will be showcasing their digital applications and solutions.